Overcast. High 54F. Winds NNW at 15 to 25 mph..
Cloudy. Low 41F. Winds N at 10 to 20 mph. 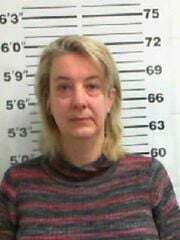 MUSCATINE — Muscatine County Joint Communications (MUSCOM) Manager Beverly Griffith has resigned from the position following her March arrest. Griffith, 46, was arrested and charged March 20 with tampering with records, an aggravated misdemeanor, for allegedly falsifying her official time sheet for the county. If convicted, Griffith could face up to two years in prison. Muscatine County Joint Communications Commission Chair Jeff Sorensen said the commission voted to accept Griffith's resignation during Monday night's meeting. The commission oversees employment for MUSCOM. The user group for the commission, with Muscatine County Sheriff C.J. Ryan as chair, was asked by the board to select and appoint an interim manager. The user group supervises MUSCOM operations. According to the arrest affidavit, Griffith indicated on her time sheet she was working for the county when she was "working at a licensed liquor establishment in Muscatine County as bartender." Times were falsified multiple times throughout January and February. Griffith was hired by the commission May 31 to manage emergency communications and dispatching service for the county. She was placed on unpaid leave following her arrest. According to an ad posted for the position in February 2018, the starting salary range is $56,535 to $70,930, based on qualifications and included benefits. Griffith worked for 10 years as a dispatch supervisor in Naples, Florida, prior to being hired in Muscatine County. She started in dispatch 19 years ago in Texas and had also worked in Iowa for the Poweshiek County Sheriff's Office.